Simon Ashbery is an artist, developer and designer with a history as varied as his hair is wild. Having studied fine art and then animation production, Simon moved into games development, landing a role as 3D Artist with a nascent Bossa Studios. 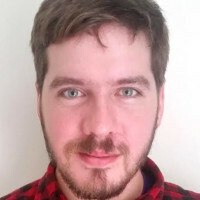 During his time with Bossa he created monsters for the BAFTA award winning Monstermind, helped develop the art style for the BAFTA nominated Twelve a Dozen, and provided the vocal talents for the hit game Surgeon Simulator 2013. Simon left Bossa in 2014 to pursue his first indie project with fellow Bossa alumnus João Guerra. The game, a reality bending artistic adventure called Rosvita, was picked up by Stugan, the Swedish accelerator programme, for their inaugural cohort and was polished into a striking demo, indicative of the final goal. Despite interest from publishers and investors, Rosvita's development became unsustainable and the project was abandoned. What followed was a series of tough realisations, difficult lessons and hard choices which eventually led Simon to reconsider how he could advance his indie ambitions and to retrain as a software engineer. After an intense 4 months of study and practice at the Makers Academy bootcamp, Simon began to understand how his past life as an artist and a game designer fit perfectly with his new-found skills as a programmer. With this realisation he soon found employment at the Victoria and Albert Museum as a software engineer in their Digital Media team. The V&A as an institute, perfectly represents and extols the intersection between art, design and technology, where Simon loves to explore. With these hard-won experiences, new-found skills and ongoing improvements, Simon is again developing games and other interactive projects, exploring his role in the Museum’s ongoing mission and looking towards the future with hope, joy and enthusiasm. There is no doom and gloom in this session; it is a resoundingly hopeful discussion that aims to destigmatise failure and provide an opportunity to learn and grow from our most challenging experiences. This session follows the course of project that is destined to fail and discusses the factors that can contribute to such a fate. The session also looks at the aftermath, both personally and professionally, of a project that comes to an abrupt end, and the process of picking up the pieces and leveraging your hard-won wisdom to do it all again, only better. Simon begins before the project starts a vital time to plan for success, whilst preparing for failure. He then moves to the initial prototypes with their freedom to experiment. Then to the heady rush of taking a demo on the road, where hubris and humility mix with equal measure. And finally, into that odd space beyond a project where the painful and liberating process of dis-entangling your sense of self from the game takes place.